What article do we use before singular countable nouns? Do we also use articles before plural countable nouns and uncountable nouns? When do we use the articles ‘a’ and ‘an’? When do we use the article ‘the’? Do we use articles before names of meals? We use a/an with singular countable nouns. 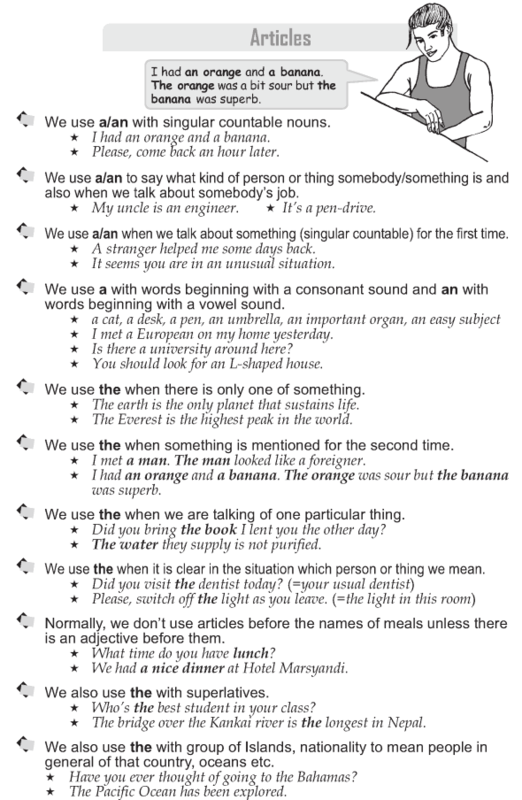 We use a/an to say what kind of person or thing somebody/something is and also when we talk about somebody’s job. We use a/an when we talk about something (singular countable) for the first time. We use a with words beginning with a consonant sound and an with words beginning with a vowel sound. We use the when there is only one of something. We use the when something is mentioned for the second time. We use the when we are talking of one particular thing. We use the when it is clear in the situation which person or thing we mean. Normally, we don’t use articles before the names of meals unless there is an adjective before them. We also use the with superlatives. We also use the with group of Islands, nationality to mean people in general of that country, oceans etc.